Sentiment at Asia’s factories stabilized in March as a rebound in China buoys the region. Japan’s Nikkei and IHS Markit manufacturing PMI for March rose to 49.2 from 48.9 in February, helped by a lift in new orders. South Korea’s PMI rose to 48.8 from 47.2 in the previous month. Still, both readings remain below 50, signaling contraction. China’s official PMI, released on Sunday, rebounded to 50.5 from 49.2 in the prior month, the biggest increase since 2012. Both new orders and new export orders, leading sub-gauges that signal future activities, rose to the highest levels in 6 months. A separate private PMI gauge published by Caixin Media and IHS Markit on Monday rose to 50.8 from 49.9 in February. Australian business confidence fell to the lowest level in almost 6 years last month in another sign the economy is losing momentum. The index level dropped to 0 in March from 2 the previous month, the weakest reading since July 2013, a National Australia Bank Ltd. report showed Monday. Confidence fell across most industries, while manufacturing was flat and mining increased. Australia’s economy slowed in the second half of last year as a property slump deepened, spooking households out of spending. The RBA has remained on the sidelines for the past 2-1/2 years, but is coming under intensifying pressure to resume interest-rate cuts. It will be closely watching the government’s budget Tuesday, expected to include tax cuts and cash handouts, to assess the stimulus to the economy. While all of this has been occurring, hiring has remained robust and the jobless rate dropped to 4.9%. The NAB report showed a gauge of employment climbed to 7 in March from 5 in February. Morgan Stanley abandoned its forecast for the Federal Reserve to raise interest rates once by year-end, and lowered its projection for Treasury yields. “We and the markets underestimated Chair Powell’s appetite to deliver a preemptive strike against downside risks to the outlook,” Morgan Stanley analysts wrote in a March 31 note. Fed Chairman Jerome Powell and his colleagues on March 20 pledged to end the central bank’s bond-portfolio run-down in coming months, and committed to watch and wait before deciding on any more moves in the policy interest rate. Morgan Stanley now sees 10-year Treasury yields ending 2019 at 2.25%, down from 2.35% previously. 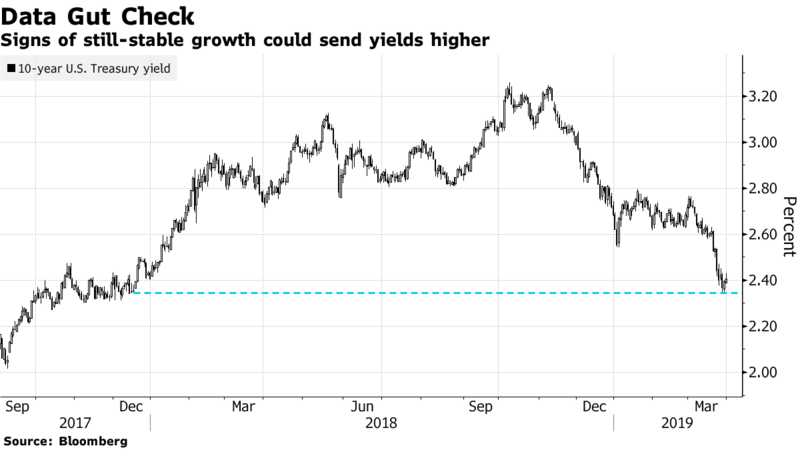 It sees two-year yields at 2.05%, suggesting a modest steepening in the yield curve. It also means the market will, as now, be pricing in rate cuts, which the bank’s economists don’t think will be forthcoming. Morgan Stanley economists had previously projected a December rate rise. According to a Bloomberg report over the weekend, treasury yields have recently sunk as if a US recession is round the corner. A bundle of important economic data this week – the biggest one being Friday’s March jobs report – could either confirm these fears, or show that they’ve been overblown. The yield on benchmark 10-year notes dropped to a 15-month low of 2.34% on Thursday amid speculation growth is faltering enough to trigger a Federal Reserve interest-rate cut this year. But there’s been little tangible US data to justify that. Even the Fed, which got yields tumbling on March 20 by shocking investors with its more cautious stance toward the economy, didn’t actually predict gloom and doom. The 10-year Treasury yield stood at 2.41% last Friday when trading closed for both the week and the first quarter. While that was above the nadir set Thursday, it was still far below the 2.61% level from the day before the March 20 announcement that sent yields tumbling. The slide in the 10-year has also taken it below the rate on 3-month Treasury bills, a phenomenon known as an inverted yield curve that’s commonly viewed as a harbinger of recession. Global issues will be on the bond market’s agenda this week, too. In addition to continued uncertainty over Britain’s exit from the European Union and Chinese Vice Premier Liu He’s planned trade talks in Washington, traders will also be eyeing factory indicators from Germany. Prices for fed funds futures contracts show traders are betting the Fed will cut its main interest rate by about a quarter point this year. That contrasts with what officials anticipate. On March 20, the median projection of Federal Open Market Committee members was for the rate to remain steady throughout 2019. Australia’s main opposition Labor Party plans to tighten rules around carbon emissions to cover the nation’s 250 biggest industrial polluters and will set a target for electric vehicle sales if it wins elections next month. With climate and energy policy shaping up to be a major issue for voters, Labor leader Bill Shorten unveiled a string of proposals Monday, seeking to steal the limelight from Prime Minister Scott Morrison’s government as it prepares to unveil the federal budget tomorrow. Australia is heading for a federal election in May, with Labor currently ahead in the polls. The party is pledging much deeper emission cuts than the government and a major spending boost for clean energy projects. Investors looking to capitalize on this space can consider the Self-Driving Car US portfolio on iAdvisor, which has been created by selecting tech and car manufacturers that are central to the theme of self-driving cars. 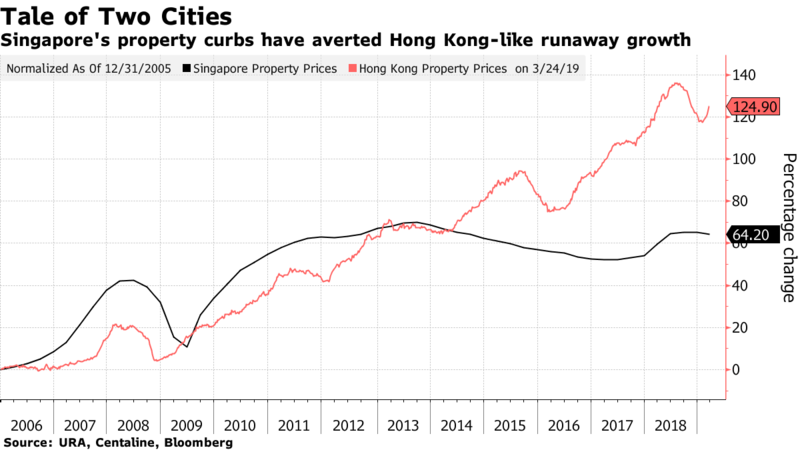 Private residential prices declined 0.6% in the 3 months ended March 31 from the previous quarter, when they fell 0.1%, the Urban Redevelopment Authority said Monday. Luxury home prices, or residences located in the prime areas, dropped 2.9%, the most since the quarter ended June 2009. Canada’s economy began 2019 with its largest output gain in 8 months, an unexpected result that will ease worries the expansion has come to a halt. Gross domestic product grew by 0.3% in January, faster than the 0.1% forecast in a Bloomberg survey of economists. The gains were broad-based outside of the energy sector, and included the biggest one-month increase in construction activity in more than five years. Manufacturing output also surged. The numbers paint a much less bleak picture for an economy that came to a near halt at the end of last year, with January GDP now putting growth on pace for a stronger first quarter than most economists are anticipating. The gains should also bolster confidence among officials at the Bank of Canada that growth will bounce back. Financial markets are betting the central bank is likely to cut interest rates because of the weak run of data until now. Canada’s economy stalled in the fourth quarter, including contractions of 0.1% in each of the final 2 months of 2018. Economists had been forecasting equally sluggish growth this quarter. USDSGD slipped for the first time in 3 sessions, declining 0.2% earlier to fall back below its 50-day moving average, after China’s better-than-expected PMI boosted overall risk sentiment. USDSGD has largely been bound between the 1.3500 and 1.3600 handle over the past 3 months. AUDUSD jumped by as much as 0.5% earlier today, largely due to better-than-expected Chinese PMI data. The pair’s gain may be short-lived though, ahead of Tuesday’s RBA policy decision and budget announcement. A decline back below 0.7100 is expected. USDCAD maintained near a 1-week low Monday, following the Canadian dollar’s rise on Friday which was boosted by strengthening crude oil prices, as well as better-than expected Canadian GDP data. A retest of the 1.3200 handle, near the pair’s 200-day moving average at 1.3194, is a possibility this week. USDCNH slipped earlier to a 1-week low, on yuan strength following positive factory data from China over the weekend. A retest of the key 6.6737 support, tested twice over the past 2 months, seems to be likely this week. Another event to keep an eye out for this week is the resuming of US-China trade talks, as Vice Premier Liu He makes his way to Washington on Wednesday. USDJPY continues to rise, amid improving risk sentiment. The pair regained above 111, and looks set to make another attempt the crack the 112 resistance, having failed to dos so last month. A failure to regain above 112 in the near future could signal USDJPY’s exhaustion of its climb from the sub-106 January low. GBPUSD continues to remain under pressure as British lawmakers continue to raise barriers for an orderly Brexit, as the pair continues to languish near Friday’s low of just above the 1.3000 handle. Further Brexit uncertainty could possibly drive the currency pair below the 1.3000 support.